Valves are strongly curved and semi-circular. 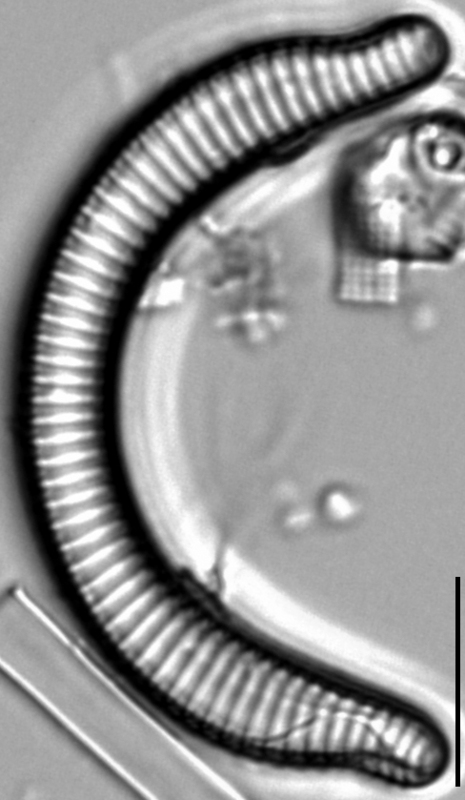 Apices are reduced in breadth (3.0-3.8 µm) and subrostrate. Valves at the small end of the size range have a more pronounced dorsal shoulder. Apices are slightly recurved in some specimens. 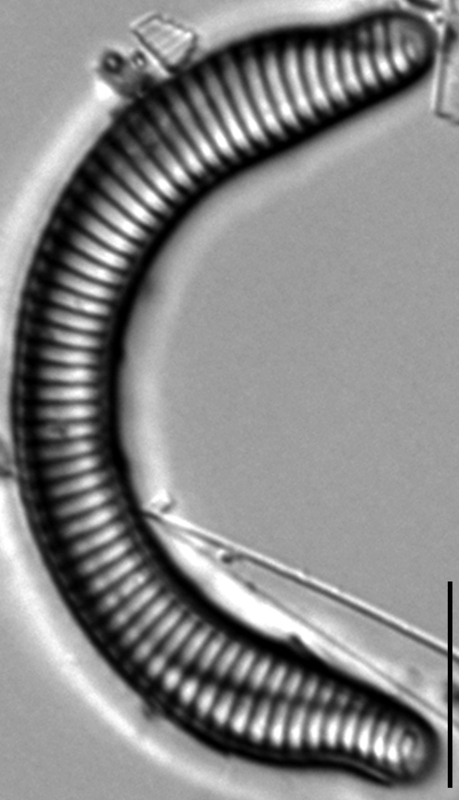 Striae are nearly perpendicular to the dorsal margin, numbering 12-13 in 10 µm. 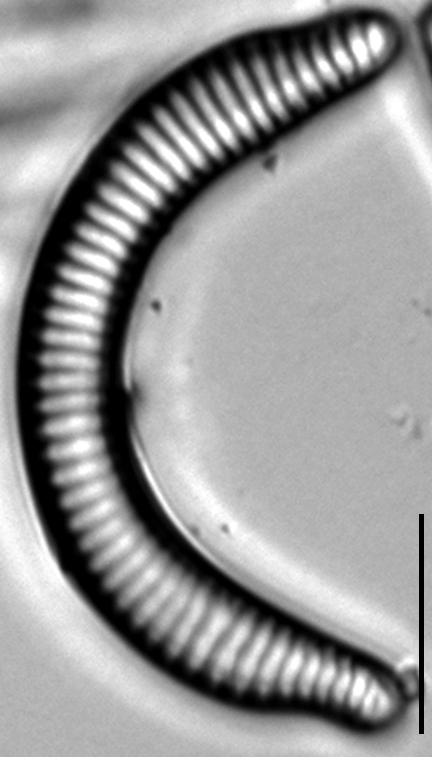 The striae are separated by externally thickened, transapical costae. The costae terminate on the dorsal margin as prominent, planar wing- or spine-like projections. A reduced raphe is present on the ventral valve mantle interface at the apices, but it may not be discernable in LM. Areolae are not visible in LM. Rimoportulae are absent. 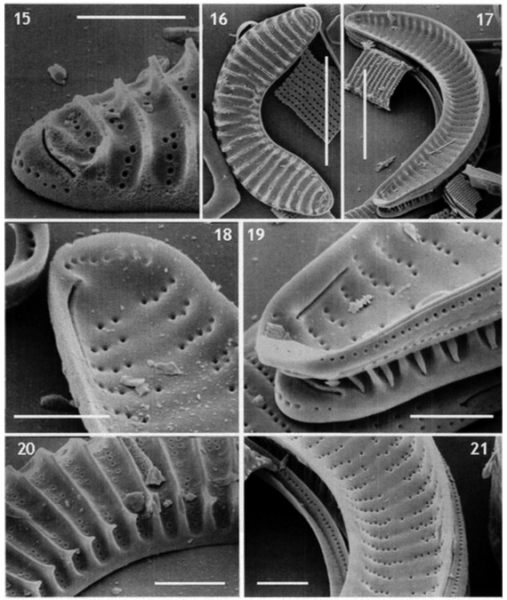 There are a number of reports of Semiorbis hemicyclus in North America (Patrick and Reimer 1966, Camburn and Charles 2000, Siver et al. 2005). However, Reid and Williams (2010) examined specimens of Semiorbis from North America and Europe, concluding that S. hemicyclus occurs only in Europe and Greenland, but not in North America. 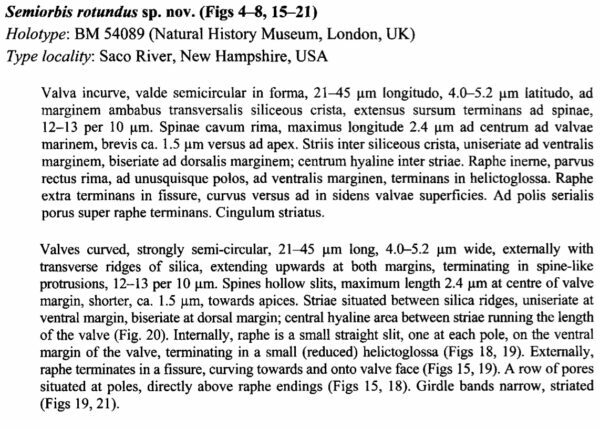 In that work, Reid and Williams described S. rotundus, and determined that this taxon occurs in North America and Japan. We concur that some North American records conform to S. rotundus (Camburn and Charles 2000, p. 21, Pl. 15, Figs. 22-24, Siver et al. 2005, p. 184, Pl. 27, Fig.6 , Pl. 77, Figs. 1-2). We did not, however, examine additional voucher specimens of North American S. hemicyclus. Further work is needed to determine the morphological differences and the geographic distribution of S. hemicyclus and S. rotundus. 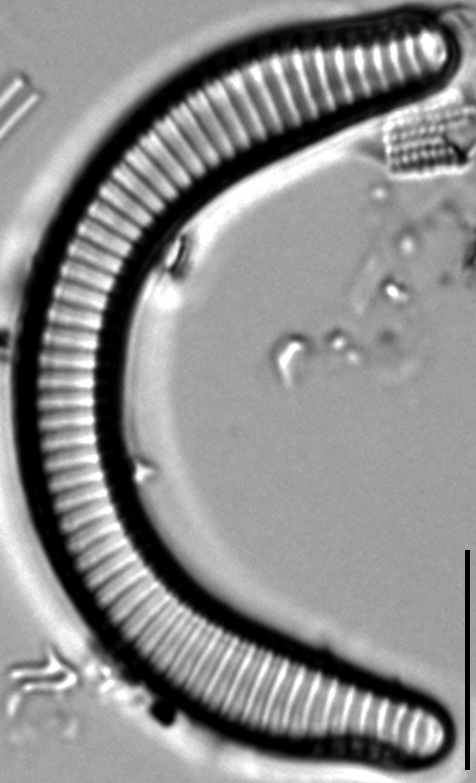 Semiorbis rotundus is known to occur in low pH ponds of New Jersey (Siver and Hamilton 2011) and low alkalinity lakes of the Adirondacks (Camburn and Charles 2000), reported as Semiorbis hemicyclus in both references. Valves curved, strongly semicircular, 21-45 µm long, 4.0-5.2 µm wide, externally with transverse ridges of silica, extending upwards at both margins, terminating in spine-like protrusions, 12-13 per 10 µm. 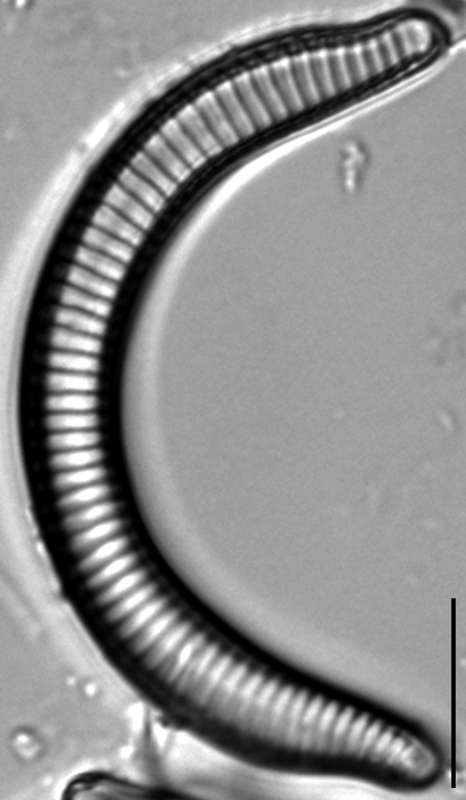 Spines hollow slits, maximum length 2.4 µm at centre of valve margin, shorter, ca. 1.5 towards apices. 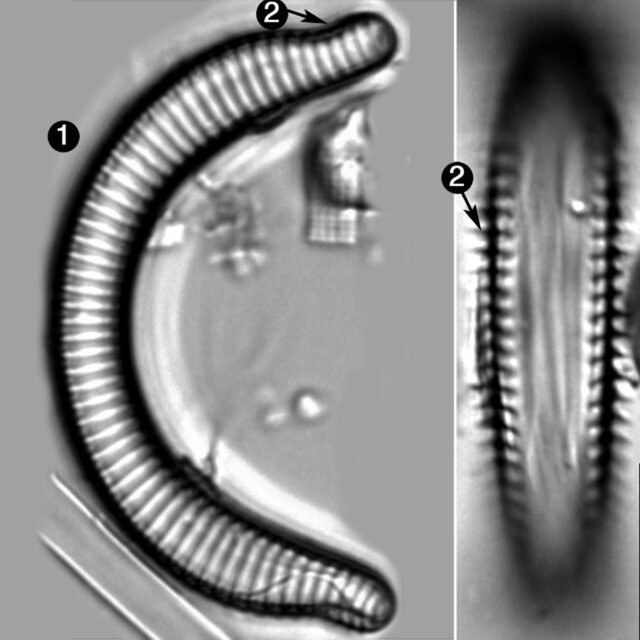 Stria situated between silica ridges, uniseriate at ventral margin, biseriate at dorsal margin; central hyaline area between striae running the length of valve (Fig. 20). 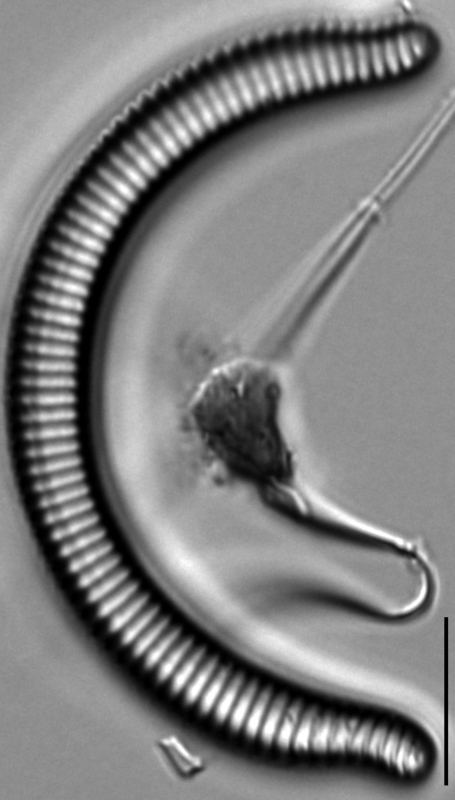 Internally raphe is a small straight slit, one at each pole, on the ventral margin of the valve, terminating in a small (reduced) helictoglossa (Figs 18, 19). Externally, raphe terminates in a fissure, curving towards and onto valve face (Figs 15, 19). A row of pores situated at poles, directly above raphe endings (Figs 15, 18). Girdle bands narrow, striated (Figs 19,21). Valves are strongly arched and semicircular. Apices are subrostrate and may be recurved. Transapical striae are separated by externally thickened transapical costae, which at the dorsal margin, form wing-like projections.